Last week, I celebrated my 30th year. And not many months ago, The Empire Strikes Back celebrated its 30th year as well. Coincidence? Hmmm...maybe, but maybe not. So, when it came to party ideas, it only seemed natural to celebrate the 30th anniversary of the triumph of the Dark Side on both accounts! This was the most insanely awesome playset we ever had in our house. Period. Wampa cave! Rubber glove trampoline! It was awesome! And it definitely played a part in cementing my love for Empire and homemade DIY crafts. Now, an Empire party -- perfect way to celebrate both loves! This week I'll be posting pictures of my spectacular The Empire Strikes Back themed 30th birthday celebration for grown-ups and all of the homemade crafty, nerdy goodness that made it so. That's right, Monday to Friday -- all Empire -- Mynocks to Fett comma Boba. Like this Wampa birthday cake you see here. 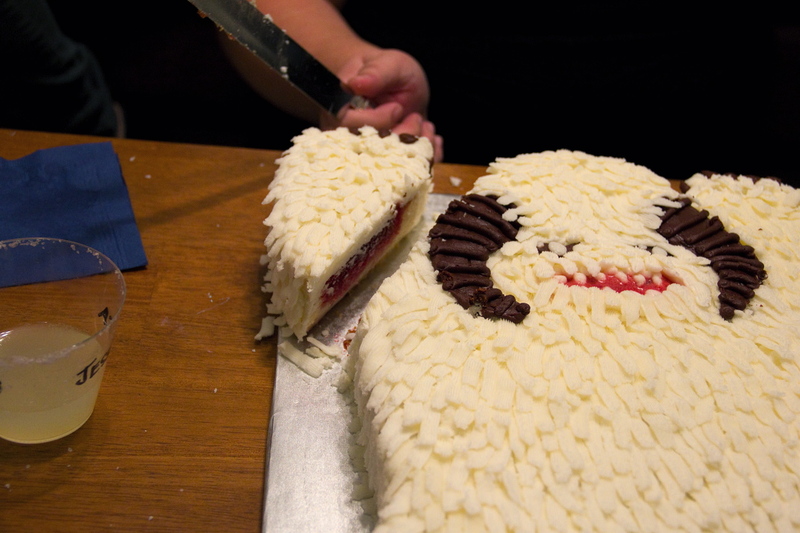 Made with my mom's classic sour cream pound cake recipe shaped into an Alicia style Wampa, buttercream icing, and one very forgiving decorating style -- I'm tempted to make only shaggy monster cakes from now on. Hmmm, what creature might we encounter next?!?! Tune in tomorrow for more Empire Birthday goodies! *Oh and here's a little shout out for the week to my friend, Paul Adam, who so generously gave me permission to post his (way better) photos of the shindig. Plus, when I'm hostessing, I never ever take photos (too busy chatting it up), so good thing he was there! Thanks, Paul! Whoa I can't believe that Woman's Day play set was... a thing... that happened! How cool were the 80s?? And that cake is amazing! The cake looks great! Is there anyway to get this recipe? I did get to play with the set. 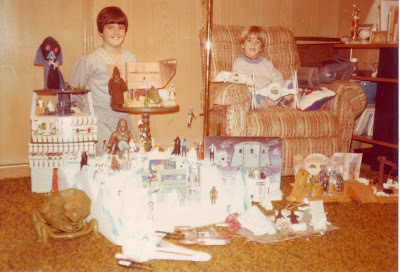 I had my own GI Joe, Star Wars, and He-Man toys in addition to my dolls (mostly, I was in charge of the girl characters, becasue I liked them best), but it was a totally fun set to play with. I'll have to ask my mom about posting the recipe since it's hers to share -- maybe so! OMG, the force is very strong with you! I found your pinata and Yoda-rita pics on Flickr, too. You need to post all the details. What other food did you make/serve? 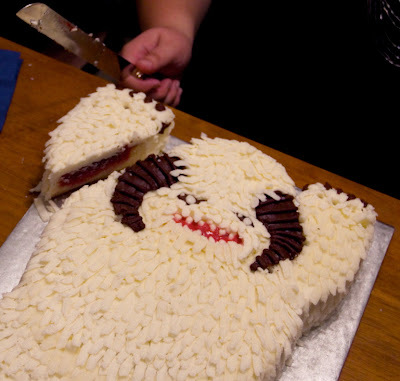 Hi and thanks, Anonymous -- check out today's post for more Star Wars tasty treats. that is the most awesome playset i have ever seen. i am beyond jealous.